Susan Lucci is an actress, author, singer, television anchor and businesswoman from America. She is popular for her long-running role in soap opera “All My Children” portraying a willful and self-centered character named Erica Kane. The role is taken as the most popular character in the history of soap opera where TV Guide named her in The 60 Nastiest Villains of All Time list in 2013. An American actress, author, singer, television anchor and businesswoman. Her role in Anastasia: The Mystery of Anna as Darya Romanoff. 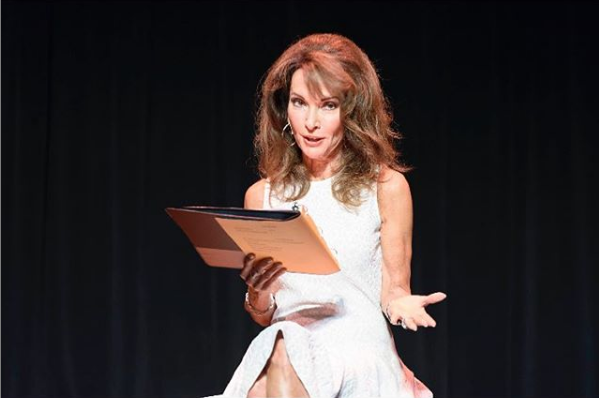 Susan Lucci had walked this runway before, but Thursday when she strutted her stuff for The American Heart Association's annual Red Dress Collection, the cause was a little more personal. The day before the fashion show, the longtime soap opera actress revealed on social media that she had undergone heart surgery in October after developing a "90% blockage" in her heart's main artery," and "narrowly missing a severe heart attack," she wrote on Instagram. Susan Lucci was born in Scarsdale, New York. Her birth name is Susan Victoria Lucci. Her father, Victor Lucci, is a building contractor, while her mother, Jeanette Granquist, was a homemaker. Her mother is of French, Swedish, and German heritage while her father is of Italian descent. During her childhood, Susan lived in Garden City, New York. Susan has an elder brother named James Lucci. Right from her childhood, Susan Lucci loved television soap operas. Talking about her education, She attended Garden City High School and graduated in 1964. Because of her love for soap operas, she attended the Marymount College in Tarrytown, New York. She majored in drama and earned a Bachelor’s of Arts degree in drama in 1968. On 16th January 1970 to 23rd September 2011, Susan Lucci worked as Erica Kane on the ABC television soap opera 'All My Children'. In 1978 she was nominated for the Outstanding Lead Actress in a Drama Series Emmy for her on All My Children. In 1982, she played a minor role in the comedy film Young Doctors in Love. In 1986, she performed the role of Darya Romanoff in the Golden Globe and Emmy Award-winning TV movie Anastasia: The Mystery of Anna. From 1990 to 1994, she featured as a guest on the nighttime soap opera Dallas. In 2008, she participated in Season 7 of Dancing with the Stars with dance partner Tony Dovolani. On 5th November 2008, she was eliminated from the show and was sixth in the competition. On 15th November 2012, she performed on The Colbert Report in a segment reflecting the soap opera-like nature of the Petraeus scandal. In 2015, She was inducted as a Disney Legend. In 2017, She appeared as a Shelley Waxman in Difficult People and gives a voice in an animation movie Ralph Breaks the Internet (2018). Besides, she wrote and an autobiography titled 'All My Life: A Memoir' which released on 29th March 2011. She has a jaw-dropping and mouth-watering net worth of $ 60 million dollars and this proves how successful she has been. It is all her hard work and talent that has made her this successful today. In addition, She is also active on popular social networking sites such as Twitter and Instagram. She has an amazing more than 71k followers on Twitter, and this proves how popular she has been on the site. She has not only been popular but quite engaged too as she has already tweeted in the site more than 2400 times till now. Her personal life has been as perfect as her and her career. She was dating her boyfriend Helmut Huber before the couple decided to get married and live happily as husband and wife. The couple tied the knot in the year 1969 and till now they are going very strong which leaves the chances of divorce to occur in their lives to a very minimum. They are the parents of Liza Humber, soap opera actress born on 22nd February 1975 and Andreas Huber, an aspiring professional golfer. Lucci became a grandmother when her daughter, Liza Huber, gave birth to Royce Alexander on 23rd December 2006 and Brendan, on 16th August 2008. Her third grandchild, Hayden Victoria was born on 23rd March 2011; and her fourth grandchild, Mason Alexander was born on 6th February 2013. In addition, She actively supports Little Flowers Children's Services of New York, a child-care agency providing foster care and adoption. Also in 2000, she was chosen as the celebrity spokesperson for the March of Dimes' National Ambassador Campaign. Talking about her physics, Susan Lucci has a well-toned banana-shaped body with a weight of 47 Kg. She has a body measurement of 35-25-35 inches along with a height of 5 feet 1 inch. Her bra size is 32B with beautiful brown eyes and dark brown hair color. Furthermore, she wears a 7 (US) size of shoe and 2-4 (US) size of the dress. After 19 nominations and no wins, she finally won a Daytime Emmy Award for the role of Erica Kane in All My Children (1970) in 1999. Has her own line of hair care products, perfumes, lingerie and skin care called The Susan Lucci Collection. (February 6, 2019) Had emergency heart surgery last fall.